Qfiber is a revolutionary infrared heat wrap which delivers heat deep into the muscle where its therapeutic effect is needed to help relieve pain, relax muscles and speed up the recovery process. Most conventional heat wraps heat the surface of your skin, so you feel warm, but they fail to deliver the heat deep into the muscle where it is needed. Only infra-red heat wraps achieve this. Infra-red heat penetrates up to 2 inches to warm deep muscle and it is completely safe. The unique Qfiber heat wrap is designed for anyone needing to apply heat to muscle tissue. It is used both by athletes and people at home. The Qfiber is a high tech therapeutic contoured body wrap, and works by combining the special infra-red heating coil with Qfiber fabric. The therapeutic energy is then dispersed all around the treatment area. Used on just about any body part including knees, legs, shoulders, arms and ankles the Qfiber is effective as well as versatile. Because infra-red heat is working deep into muscles it does not “feel” as warm as a conventional heat wrap or pack. That is because the heat receptors on your skin do not detect the warming infrared energy that is going past them. That is why Infra-red heat wraps do not feel as warm as conventional heat wraps and heat pads. Uniquely the Qfiber is powered either by USB, by car charger or by battery pack so it can be used in the car, at a desk, on the go or when simply relaxing indoors. The Qfiber comes with a one size fits all strap which can extend to fit up to a 52inch waist. As well as this, the Qfiber comes with an additional strap which means it can then fit around the abdomen, hips and lumber. An additional Qfiber designed for wrists is also available. 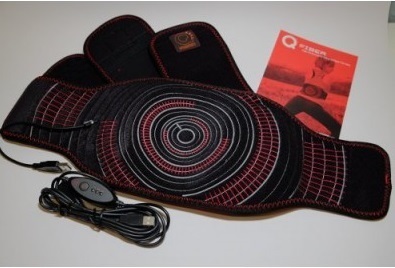 Available from www.jdharris.co.uk priced £69.99 the Qfiber Heat Wrap Pad has a 90 day money back guarantee. The Qfiber Wrist Heat Wrap is priced £49.99.